Crazy real video – must watch! This guy from Israel jumped from the cliff into the lake, but an earthquake hit when he was mid air. 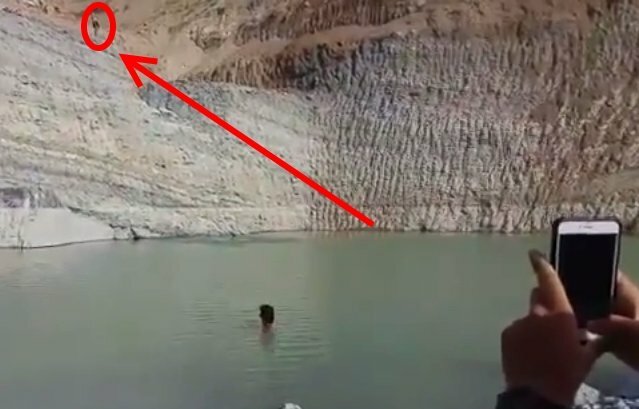 Watch this amazing real video until the end, it’s about a minute, to see the rocks starting to fall all around as the cliff collapses into the lake. What are they saying? Short translation just below, scroll down. Israeli traveler Ron Bezalel took this video in Lake Menahemya, down in the South of Israel. The guys were fooling around with cliff jumping into the seasonal lake. Just then, a 5.3 earthquake hit the Sinai Desert in Egypt and it was felt throughout the region. No casualties reported but all felt the earth move. In case you were wondering what do they say. Well, in the beginning they encourage their friends to jump and be careful. And then the guy repeatedly says “I don’t believe!”. Like falling things and natural disasters? Did you see the video of what happens when a skier escapes the snow avalanche? Don’t miss this viral video. If you also like other viral videos with a twist, don’t miss this beautiful improvised dance. Right after a small car accident, this dancer stepped into a broken water hydrant and started dancing. He thought that no one was looking. But one person with a camera was there. Check out this amazing Street Dance. Another Briff.me exclusive video – and a good one it is! – directly from the holy land of Israel, check this out! They haven’t noticed the camera… Monks playing in the snow – Rare Video. This is an exclusive post of Briff.me, please give full credit and a link when sharing. The only publication who ran this earlier was in Hebrew from a Facebook source. Here at Briff.me, knowing that our precious time together on Earth is waaay too short for a long feed, we bring you the best of the best, like this special briff about the cliff jump and the earthquake. If you want to get more posts like this, click like on the Briff.me Facebook page.